It's official. Here is our track day schedule for the new year. Registration for each of these events is NOW OPEN! And for those of you staying overnight, feel free to book your hotel reservations. Each of the hotels has sufficient parking room for race car trailers. Saturday, June 22, 2019 - New York Safety Track. A favorite track with lots of twisty turns and elevation changes. Click HERE to download our Event Guide for New York Safety Track. Super 8 by Wyndham Oneonta/Cooperstown, 4973 NY-23, Oneonta, NY 13820. Phone: (607) 353-6875. It is almost 20 minutes closer to the track, but we could not secure a block of rooms, so make your own personal reservations ASAP. Don't wait. June is the height of tourist season and baseball games in nearby Cooperstown. Hotels book up quickly! Tuesday, July 23, 2019 - Autobahn Country Club. Located in Joliet, Illinois. A new venue for NECC to spice things up! Click HERE to download our Event Guide for Autobahn Country Club. Make your reservation prior to July 1 and mention "NECC Motorsports" to receive the very reasonable price of $99 per night. Saturday, September 14, 2019 - Pocono Raceway. High speed banked turn makes every course here exciting! Click HERE to download our Event Guide for Pocono. Up to 2 people in a Queen bed studio, $98.10. Up to 4 people in a 1 bedroom with Queen Bed and Queen pull-out, including a full kitchenette. $196.20. Make your reservation prior to September 1 and mention "NECC" to take advantage of these special prices. Then listen to this short audio file of some happy drivers from one of our events at New York Safety Track. This says it better than we can about the fantastic day you'll have with NECC! CLICK HERE to listen! Click HERE to see Video A. This one is short and sweet. It shows the faster cars going around the course. Video courtesy of Bill Tynan. Click HERE to see Video B. Here is another short video showing action at the track. Video courtesy of Bill Tynan. Click HERE to see Video C. This one is for Corvair enthusiasts. It has lots of footage of Corvairs on the track at our August 10, 2015 event at NJMP. 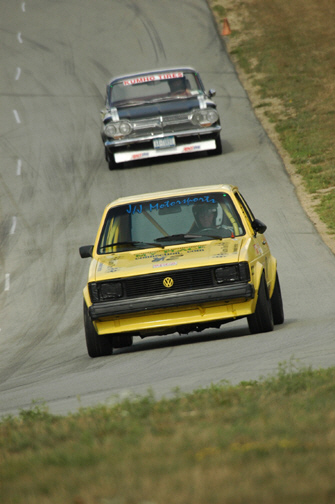 NECC started life as a group that ran time trials at Lime Rock Park in Connecticut back in the 1970s, but all makes and models are welcome (and participate) at our events now. Video courtesy of Steven Calandra. Click HERE to download a copy of the NECC High Speed Events brochure. It is a double-sided sheet with three-panel pages. Click HERE to download a copy of the NECC High Speed Events flyer. Single-side page for easy photocopying. (It's a pdf file).